Open Top Polypropylene tanks are great for mixing batches of liquids up to 500 gallons. 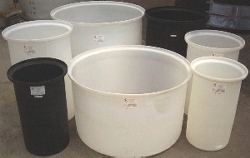 The Polypropylene tanks also work as dip tanks and for other process applications. We have sizes available from 55 to 500 gallons. The Polypropylene tanks are good for continuous use temperatures up to 200F. We make our open top tanks from several different plastics. HDPE (High Density Polyethylene) is the most widely used due to its low cost, corrosion resistance and good chemical compatibility. It is good for continuous use temperatures up to 130 F. HDPE is sometimes conveniently but incorrectly referred to as HDLPE. For storage applications that require temperatures up to 212 F., polypropylene open top tanks are a good choice. For applications that require temperatures up to 300 F., we also offer Kynar (PVDF) open top tanks. Stands and lids are optionally available for our open top plastic tanks. Stands are painted carbon steel and can include mixer mounts. Lids are made from the same plastic material as the tank. We can supply 'shoebox' lids, bolted lids or hinged lids for our open top tanks. If you need something special, we also do custom work.